Tin roof repair: Nine years later in Honaker, VA. - Roof Menders, Inc.
Tin roof repairs applied nine years earlier illustrate three important details in this restoration field. 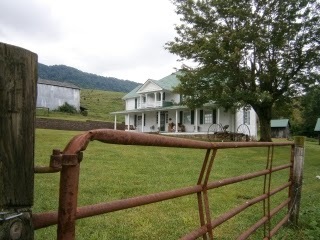 Before describing those three items, a word should be made ascribing credit to the owners of this homestead. The couple lovingly restored the interior and exterior of this family home. One of their objectives was a desire to save the old shingles. The bottom row of shingles showed the warping associated with age. One side in particular bothered the owner; the other side appeared satisfactory. 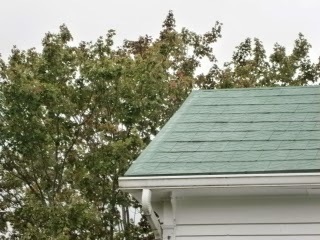 We discussed that if a lip, or edging, was installed on offending line of shingles, the other side (that now looked fine) would suddenly seem more uneven. Wisely the owners elected to add trim on the lower shingles as well as the peaked roof. Green tint in water-based acrylic tends to chalk over a period of time. 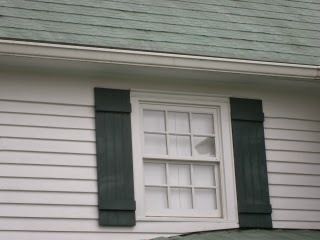 At the time of the project’s work, the color of the roof matched the tint on the shutters. This chalking action tends to look like fading. It is not. If you scratch the acrylic, the original vibrant green surfaces. The acrylic does not loose its principal purpose, which is to protect the primer, thereby sealing the rust. 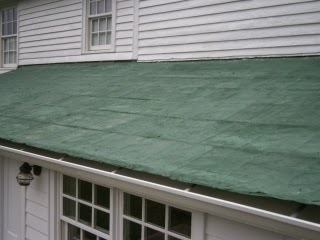 On the back side, the shingles were covered with rolled roofing. The rolled roofing was removed; the crew installed a fully reinforced system of acrylic and mesh. The imperial design is still visible even though there is twice as much material on the shingles compared to the other surface areas.